Experience the incredible flavors and surprising ease of authentic French meals, led by renowned cookbook author and culinary instructor Cynthia Nims. Discover expert prep and seasoning tips for rustic fish chowder and classic roast chicken; and develop the confidence to approach an array of recipes with your newfound skills. 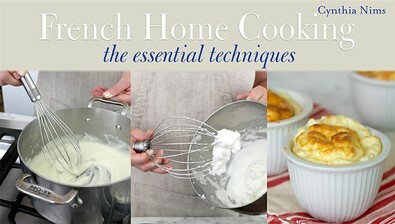 Learn to make a bechamel base for a delectable cheese souffle and whip egg whites perfectly so that the soufflee never falls flat, and explore the regional variations on a classic savory beef and mushroom stew. Create irresistible potato gratin, and learn the secrets to creating silky-smooth pommes puree. Plus, make creme anglaise, the classic dessert sauce, and use it to create a French custard ice cream with vanilla beans. Sign up to create a range of beloved French recipes with skills you'll use again and again!